Pioneers in the industry, we offer siron 936, soldering desoldering station, digital soldering stations, smd hot tweezers soldering station, analog soldering station and high frequency digital soldering station from India. We are leading manufacturer of Analog Temperature Controlled Soldering Station. Advanced and latest circuitry which maintains the temperature accurately and precisely. Applicable for wide range of applications from micro to heavy duty soldering. Thinner and comfortable grip of soldering hand piece. Different tip type/shape available to suit vast soldering jobs. • Integrated automatic "Sleep - Function"
The station switches to "Sleep Mode" if the iron is not used for longer than 15 minutes. In "Sleep Mode" the temperature is lowered to 200°C. This saves energy and prolongs the life of the tip due to lower oxidation. If the iron is lifted again, or a button pressed, the station automatically returns to operating mode and heats up to the pre-set temperature value. 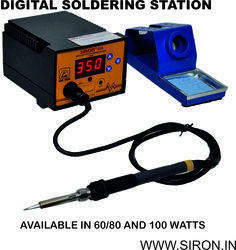 We are recommended amongst the clients for offering a quality range of Digital Soldering Stations. The Digital Soldering Stations are recommended amongst the clients for its sturdiness. 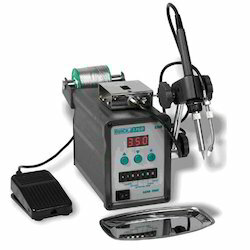 Digital temperature controlled soldering station.The product we offer is available in various sizes and specifications. Known for their corrosion resistance and fine finish these products are tested for their quality. We are leading manufacturer of SMD Hot Tweezers Soldering Station. Large-screen LCD display function shows is very clearly. Adopt SAMSUNG microcomputer control,warming-up quickly. High-quality resistance good for long service life. Soldering iron handle using silicone material. Front panel adopt alloy material with elegant appearance. Case box is small,take up less place on work table. Longer soldering iron handle line,it has 1.5 meter. Tweezers soldering iron parallel desoldering IC,make it more easy for soldering and desoldering work. Unique handle model and soldering iron holder humanity design. Very convenient for small electronic components,chip, chip removal and installation of welded components. When you need to remove the parallel electric tweezers can be used directly on the welding points across the resistor components for heating. CH1/CH2/CH3, each storage segment can store three temperature. Sleep function soldering iron automatic detection of their work status are not in use in a quiescent state, arriving to set the sleep time, the temperature of the iron automatically lower the temperature to 200 ° C enter into sleep state, can effectively prevent the oxidation of iron head and prolong the iron tip service life, energy saving and environmental protection. The sleep time can be set range 0 to 99 minutes in 1 minute steps, users can be set based on usage, if you do not need a soldering iron sleep ,the sleep time is set to 0. Automatic shutdown function after soldering iron enter into sleep state, start the timer program, set the shutdown time did not wake up from sleep, automatic shutdown, energy saving and environmental protection. Auto power off time setting range 0 to 99 minutes in 1 minute steps. Celsius / Fahrenheit temperature display function designed to meet the market needs of the different regions of the temperature display mode. 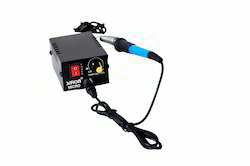 Our Analog Soldering Station or Analog Temperature Controlled Soldering Station are fitted with Original Japanese fast heating Ceramic Heater and long life soldering tip. One year warranty on Temp. Controller unit. 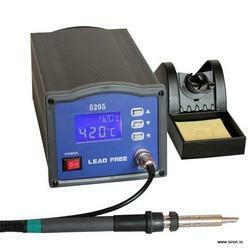 We are offering of High Frequency Digital Soldering Station. 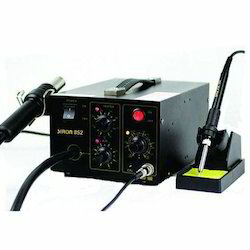 We are leading manufacturer of Siron 376D Soldering Stations. High frequency heating, rapid heating, and thermal recovery. Many types of tips are available with easy replacing. Micro computer control, digital temperature calibration, temperature set by keys, auto-sleep function. Auto and manual ways of solder feeding optional, auto solder feeding mode can solder nine successive soldering points at most. Powerful motor, automatic feeding, sliding switch design. More functions available and adjustable, such as feeding speed, feeding volume, interval time, and backing time. Two types of feeding hose optional and easy to use. The long hose is suitable for flexible soldering, and the short hose is suitable for fixed soldering. Pedal switch and manual switch available. 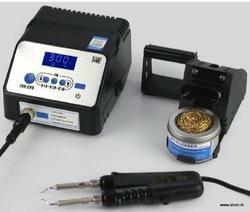 We are offering of Micro Soldering Station our valuable clients. Temperature adjustment by rotary control knob. The cable is suitable for 180 degree. 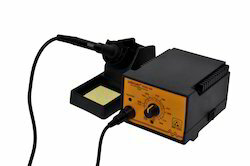 From the wide range of our products, we offer optimum quality Soldering Station. This soldering station is available in various customized designing options in order to fulfill various needs of our customers. Looking for Soldering Station ?